To open the information session at Toronto’s Alliance Française Theatre on December 6, André van der Heyden, VP & COO, Belgian Canadian Business Chamber delivered a brief welcoming statement from H.E. 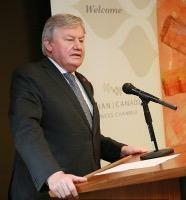 Raoul Delcorde, Ambassador of Belgium to Canada. Click here to see the full statement: message-from-he-delcorde-docx. Click here for the Agenda: 2016-12-06-bwb-draft-agenda. As 2016 comes to a close, I have the pleasure to share with you the highlights of a very busy and successful year for the BCBC. For the second year in a row, we have held a significant number of high-caliber events, and have continued to build on new initiatives to serve you better. We have added a partnership with CHOQ-FM/GrandToronto.ca and Aline Ayoub HR to those signed previously with the Alliance Française, CanCham BeLux, and MTFX, and we are exploring several others as well. 2016 has been a tumultuous year for Belgians worldwide, and in Toronto in particular. It began with some great news, as just before the New Year, Brussels Airlines announced that they would be launching a new direct flight between Brussels and Toronto; they further approached the BCBC to help with the promotion of this new flight, beginning with an Executive Luncheon in January. We continued to work closely with Brussels Airlines in anticipated March 27th launch of this new service. Alas, as we all know, March 22nd was a dark day for Belgians as Brussels was the target of coordinated terrorist attacks striking Brussels Airport and the Maelbeek metro station in downtown Brussels. That evening, the BCBC organized a press conference and candlelight vigil at Nathan Phillips Square during which we shared statements from H.E. Raoul Delcorde and ourselves, followed by Mayor John Tory sharing a few words of his own; we are particularly grateful to Mayor Tory for having taken time away from the memorial for his predecessor, Rob Ford, which took place simultaneously at City Hall. The following week, our media partner, CHOQ-FM, provided members of our community with the opportunity to reflect on these atrocities and what it means for Belgians, both at home and abroad. Thanks to all of you who attended our AGM, and a special thank you to a dedicated Board of Directors for their tireless efforts over the past year!. Without these efforts, we would not have such a vibrant Chamber. The 2015-2016 year has once again been an active one for the Belgian community in the GTA. In the past year, Canada as a whole, and Toronto in particular, has received a lot of attention from the highest levels in Belgium. This began in October with a Trade Mission to Western Canada led by HRH Princess Astrid. 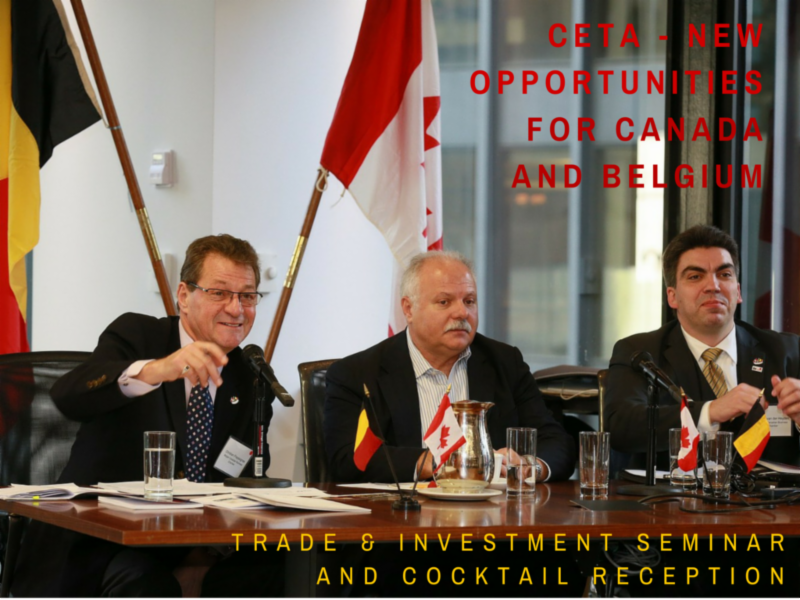 Following this, Jean-Claude Marcourt, Vice-Minister-President and Minister of Economics and Foreign Affairs of Wallonia, led a delegation to Toronto which participated in our “Business with Belgium” Trade & Investment Seminar prior to engaging in B2B meetings with local counterparts. Christian Frayssignes, Vice-President, Belgian Canadian Business Chamber set the overall tone for the Business with Belgium seminar by reminding attendees that as a small, stable and geographically strategic marketplace, Belgium is an ideal entry point for Canadian exporters to expand into the European Union. In her brief comments on how the EU functions, Nadiya Nychay, Partner, Dentons Europe LLP, explained that the European Union consists of 28 member countries, 19 of which share a common currency, the Euro and is home to 500 million consumers. Unlike NAFTA, the EU is a customs union with an integrated system of trade and business regulations. However, individual member states still have their own legislation regarding areas over which they hold domestic competency. Badke is a co-production between the prolific and groundbreaking KVS (the Brussels City Theatre), les ballets C de la B and the A.M. Qattan Foundation, which administers the Palestinian Performing Arts Network. Koen Augustijnen triumphantly returns to World Stage after his praised involvement with Gudirr Gudirr (2015) and les ballets C de la B’s Out of Context — for Pina (2010). The title Badke is a play on the Arabic social folk dance “dabke.” The performance assembles a group of Palestinian dancers — diasporic artists, many of whom have trained outside of Palestine — to practice the traditional dance and infuse it with new proposals, vocabularies and ideas. With this simple yet elegant structure, Badke expresses the universal desire to belong, and uses the language of dance in an urgent negotiation between the traditional and contemporary, the local and global. This work is a highly energetic, politically charged and stylistically diverse experience in which the artists incorporate movement from circus, capoeira and hip hop. We’d like to thank all our members and friends for making this possible! Click here to see all the pictures of the evening. Noel is approaching and this is already the LAST Frites Night of the year!! This month we have the pleasure of welcoming you for a very special night at Alliance francaise de Toronto (24 Spadina Road) Join us from 6 PM! In the spirit of Christmas all the profits from this evening will be given to The Labatt Family Hearth Centre at Sickkids in the presence of Jan Craps, President of Labatt, and Dr. Luc Mertens from Sickkids. 1 Complimentary drink with your Frites Night Ticket! Snack food will be offered! As usual, we will have many prizes at the Frites Night raffle! One in 100 children in Canada are born with a congenital heart defect, and 50% of those kids would not survive without surgical intervention. The Labatt Family Heart Centre performs 85% of all paediatric open heart surgeries in Ontario, and over 80% of heart transplants nationwide. A quarter of all surgeries take place within the first month of life, and over 40% are done on children under the age of one year. Since 2009, we have performed over 25 successful fetal interventions on babies in utero. With these and other accomplishments, SickKids ranks among the top three paediatric heart centres in the world, due in large part to the investment of our philanthropic partners.